A complete guide to certification for the medical assistant, one of the fastest-growing occupations in the United States. Medical assisting is one of the fastest-growing professions in the United States and is showing one of the highest growth rates of any profession. Certification for medical assistants opens the door to opportunities and higher salaries, is required by many managed care organizations, and may become legally mandated in the near future. Medical assistants held 417,000 jobs in 2007 and the number continues to grow. Recertification is required every five years. Kaplan Medical Assistant Exam Reviewprovides a complete guide to certification for the medical assistant. 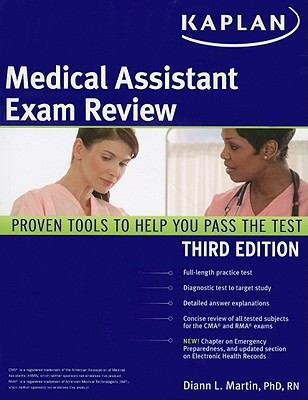 This comprehensive book features: Review of all tested subjects for the CMA and RMA exams Kaplan test-taking strategies Diagnostic test Full-length practice test (CMA) with complete answer explanations Career resourcesKaplan Publishing Staff is the author of 'Kaplan Certified Medical Assistant Exam', published 2010 under ISBN 9781419553417 and ISBN 1419553410.